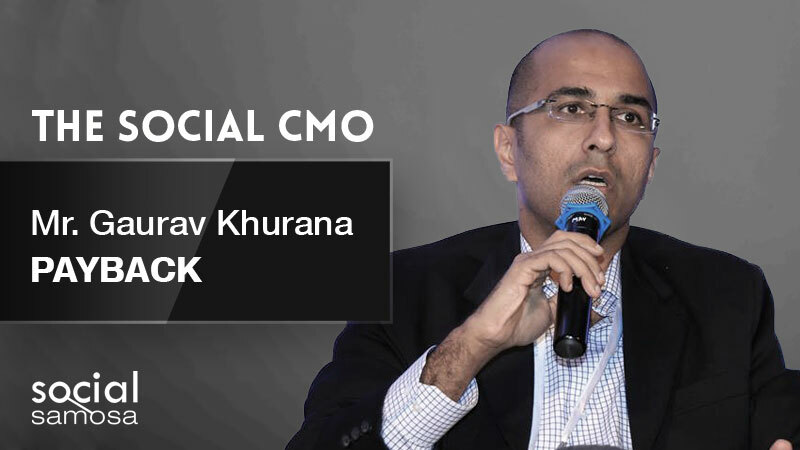 Gaurav Khurana, PAYBACK India shares their social media strategy while sharing dynamic trends and tips. When consumers’ attention span is lower than that of a goldfish, loyalty becomes an asset, difficult to earn. Built on the thought of pooling loyalty benefits for consumers and brands, PAYBACK India has been steadily growing in this segment. As a B2B brand, mastering consumer loyalty, PAYBACK’s views on social media marketing hit the bull’s eye. In conversation with Gaurav Khurana, Chief Marketing Officer- PAYBACK India, Social Samosa gets you the best takeaways. As a brand, what is your objective from social media? Today, social media is an integral part of most brands’ core strategy and is aimed at maximising the reach, recall and engagement and so is the case for PAYBACK. It has been a key driver to educate & spread brand awareness about the network and our partners amongst our users on an on-going basis. We need to understand that transactional loyalty is short lived and the future is moving to an ecosystem of loyal and engaged customers who come back to the brand because it understands them, cares for them and rewards them. By actively creating engaging content and effective stories around the brand promise, we hope to reach out to more and more consumers. Consumer loyalty is not exactly an engaging genre – what kind of content hooks do you use to engage with your audience on social media? We are committed to making every consumer interaction a rewarding experience ranging from everyday activities such as shopping, travel, grocery shopping, watching movies, fuelling your car, cab bookings, to mention just a few. And, we reward and delight our members for each little thing they do. We create our content hooks around same genres and use many interactive channels like videos, GIFs and other innovations to communicate with our members. Where do social media stand in the scheme of things at PAYBACK? What percent of your marketing budget is reserved for social media? Social media is an on-going process and it plays a vital role in our strategic planning. At PAYBACK, we like to keep our content succinct and informative. We feel that engaging our consumers through social media in a contextual form is essential and enables us to drive success and innovation. Considering social media as one of the important channels for PAYBACK, a significant part of our budget is spent on digital & social channels. And we are happy to say that this has resonated extremely well with our audiences and we are seeing a good ROI. How would you describe your brand voice on social media? Our brand voice is provocative, easy, witty and edgy. We’d like to say that we enjoy pushing boundaries with our content and hope we cut across the clutter by driving recall and building our social communities. What are the parameters that make up your measurement metrics? How do you calculate RoI? Tracking and engaging measurement metrics are intrinsic in our business. We receive and analyse copious volumes of data to identify and map consumer behaviour and subsequently use this intelligence to improve our campaign deployment. Our data systems cover number of impressions, fan growth and our reach, engagement and conversion on our consumer base just to mention a few. As a consumer loyalty brand, how much does social media help in generating leads? It is a very effective medium for generating leads. We work closely with our partner brands; and we help them in driving quality traffic, and relevant conversions on their numerous offers and product promotions. Any social media lead generation tips for start-ups? It’s a digital world and content is the king. Great content leads to more traffic. This increases our visibility and generates more leads. We curate content for different channels as audiences differ for each of them. We create content that connects to our audiences and in turn, it connects them to the brands. It’s essential to keep content exciting, sharp, crisp and informative to reach out to the right audience. Storytelling is a fundamental part of this business. It enables a brand to communicate with the consumer and helps them understand and identify with a brand. The essence of creating interactive content is to engage with audiences, once we do that, it translates to conversions. How important is it to use social media for employment loyalty and engagement? How do you achieve the same at PAYBACK? Employee loyalty and engagement is a key to any business success. Globally, we are a company who drives this vigorously and interact with our employees using social media channels. In India market currently employee engagement is more internal though we are looking to capitalise on the social channels in future. Our employees are our equal partners and consumers. We believe that delighting our employees creates long term loyalty and this benefits in driving growth to the business. Hence we are always looking at new and innovative means to engage with them.